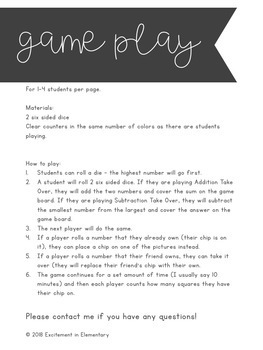 Addition and Subtraction TAKE OVER is a fun math game that allows kids to practice their basic math facts. 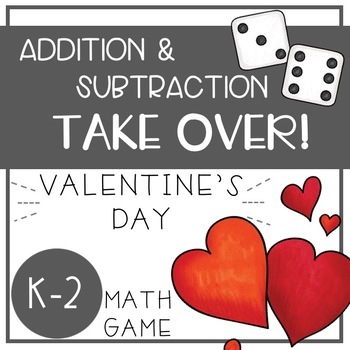 Making Math Fun with TAKE OVER Games! This set features an addition game and a subtraction game, with 5 different cards for each game (10 in total). To play, you will need two 6 sided dice, and clear counters for your students to use. Kids will take turns rolling the dice, adding or subtracting the numbers, and covering the corresponding number on the game card. The game goes as long as you like - I usually set a timer for ten minutes, and when it goes off the kids count how many numbers their chips are on. For durability, I recommend printing on cardstock and laminating.